Evicted couple, LK4 and Koketso, have finally had to part ways as the Ugandan basketball player boarded a flight home earlier today. Both former Big Brother Housemates tweeted about how sad they were to be parting ways after their short but heavily publicised romance in the Ruby House. This is probably the saddest day since my existence. I love South Africa and u treated me well. @kokamod I'm missing u already and Hurting. The Ugandan hottie has comfortably worn his heart on his sleeve (and his Twitter page) while the South African beauty has remained mute about her feelings. @kokamod I can't stop thinking of u n this isn't fair. I have an obligation to go go back home to Uganda to c press but ur in my heart! This should excite fans who have rallied behind the two while they were in the house and even after their Eviction last Sunday. Grace Oghena - It was so painful. LK4 and Koketso, I love you guys and wish you the best in your relationship. Maneo Black-bone Nketsu - They look so great together. I so wish it could be the start of something very serious regardless…I really love them. Blessing Pearl Oben - I cried when Koketso and LK4 left the House, don’t know why but it really touched me. Miphi Phiri - We love them and miss them soooo much! Otiliah Tuelo Modongo - They look so good together! Luv them a lot though and wish them the best of luck if that's what is really happening. LK4 and Koki take care of each other guys. Koki is a vey beautiful and classy lady - I wish LK4 can realise how lucky he is and jus man up! I was just crying reading the farewell Tweets, oh my beautiful couple! 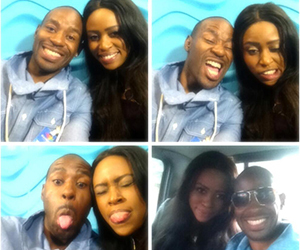 I use to rush home just to watch u guyz and BBA is not the same without you! Please don't let circumstances come between you guyz. Wish you all the best in your relationship!! Koki and LK4 u guyz must take each other to the altar guys,u are so good together. Wish u can get to have your own TV show where we fans can get to watch u! Farewell LK4 and save flight. We love you guyz! Best wishes LK and Koki...Mcwaaaa!!! I go to bed early since you left the house guyz. Your eviction was so Painful! So good to see u happy and Good luck for the future! Ohhhh pls, U all get a life, that why the world is the way it is.....y'all actually beliv the lieees, after all he said Some hours b4 his eviction(sat. Nite)and what he said to big brother in the dairy room. * really shaking my head for y'all*!!!!! Why so angry wit us cheering our fav couple. We love them and only God knows their future. Please let them be! I love u my dear beautiful Koketso, may God shine through in your life and evil must never follow u dear! Abeg make we hear word! Wats all these? All na wash jur!!! what are you doing here?? You dont have to read our comments if u are going to have a heart attack. We are also tolerant of your comments made to support other housemates. You dont own this so back off!! I was so sad on Sunday when Koki en LK4 left the house.I even dont watch BBA anymore.My husband was exually glad,but what is there to watch.Koki keep your head up high.You had nothing to loose.I caanot believe that a 44year old lady cried when you were left the house. probably d saddest of moments wen u gata tel her gud bye.